The Center Will Not Hold, now exhibiting at La Salle's Museum of Contemporary Art and Design suggests moving away from the center and imagining an alternative future—but its overall mood is cynicism. During opening night, Alfredo and Isabel Aquilizans’ work titled Here, There, Everywhere: Project Another Country (2018) was popular among museumgoers. A towering satellite dish carrying thousands of houses made of recycled cardboard—“resonant” locally as protection for the homeless while they sleep—was impossible to miss and was undeniably the show’s centerpiece. Previous works of the Aquilizans include personal belongings neatly stacked into cubes evoking balikbayan boxes, angels’ wings made of hand-forged sickles, and commissioned kitschy landscape paintings cut and reframed to form fragmented scenes. 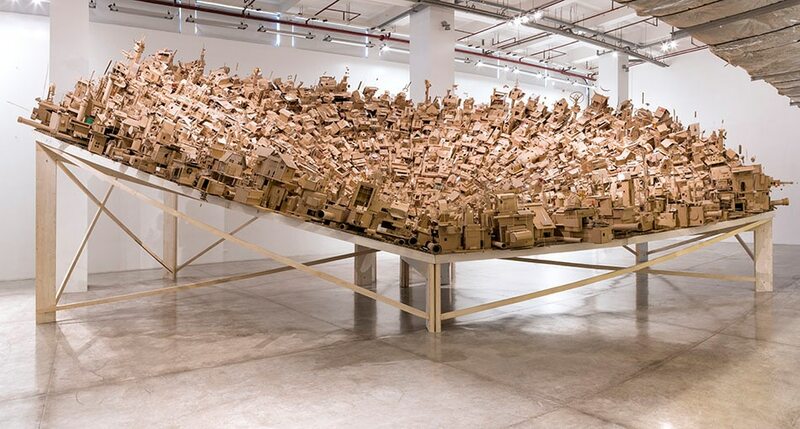 Fitting their modus operandi of accumulating symbolic objects to construct monumental installations, Here, There, Everywhere presents a sprawling urban landscape based on a town in Chengdu, China while simultaneously suggesting Manila’s urban poor. 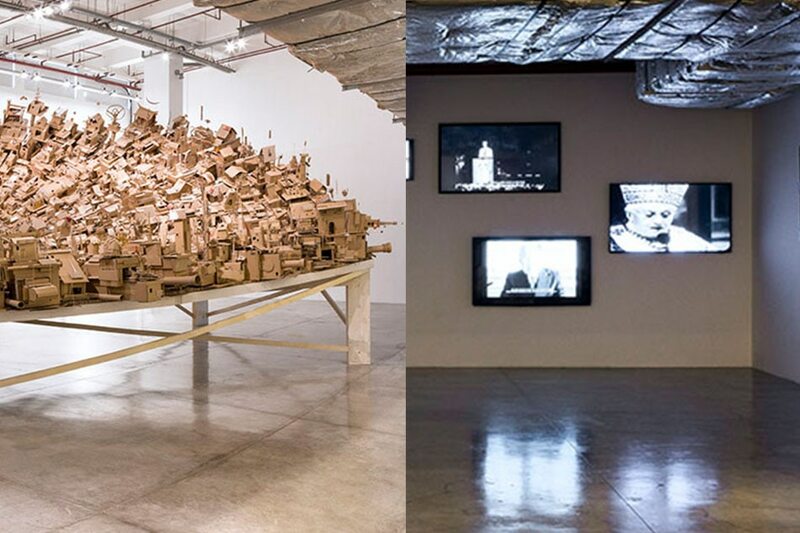 As though to suggest a connection with the exhibition’s title, the installation features a square hole at its center; an allusion to the disappearance of the old city square in Chengdu but also paradoxically suggesting both a whirlpool of cardboard houses, tubes, and antennae and a centrifugal scattering of structures. On the mezzanine was Tintin Wulia’s Terra Incognita, et cetera (2009) which was also a popular viewing experience during the opening. A mural of a dymaxion map is the locus of Wulia’s game-performance. Viewers were invited to participate in this rule-based collective painting by “claiming land.” Wulia’s tongue-in-cheek exercise in cartography is an attempt at demystifying maps through the foregrounding of its underlying power dynamics—via props like toy money and cocktail umbrellas caricaturing the wealthy—and emphasizing the arbitrariness and fluidity of national borders. 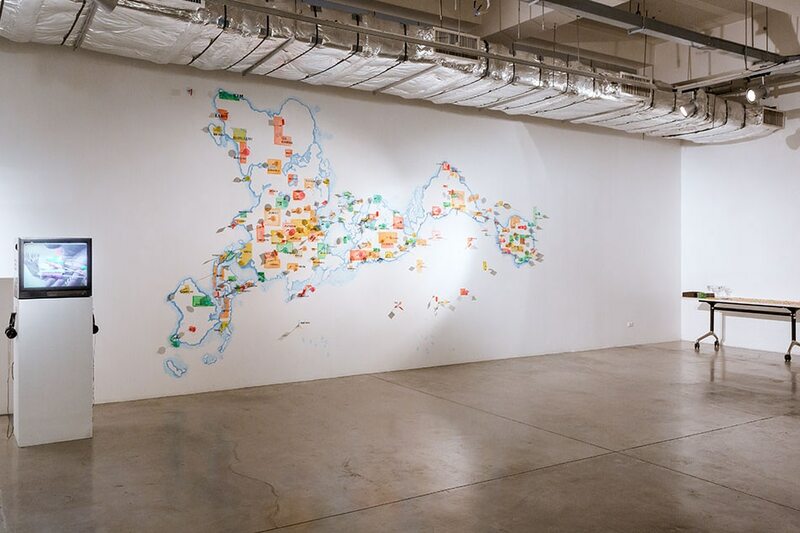 Flanking Wulia’s participatory installation are 100 Hand Drawn Maps of My Country (2008-2014) and Untitled (2016), two series of works by Shilpa Gupta. Adopting a subtler and less caustic approach to geopolitics, Gupta addresses issues of identity as they relate to perceptions of borders, the body vis-à-vis space, in 100 Hand Drawn Maps, a project conducted in several countries—the artist asked 100 participants to draw the shape of their country from memory which she then overlaid to achieve wiry forms. Untitled, on the other hand, features sparsely traced images of moments at the Knesset when members of the parliament were violently interrupted and dragged away from the podium. These silenced figures, however are omitted, their outlines merely implied. Downstairs, behind Unrestricted Areas, is another work hinged on an absent central figure. Lifting Barbells (2015) is Kim Heecheon’s attempt to accept his grief over his father’s fatal bicycle accident. The video is a series of ruminations on death and the impact of digital technologies. 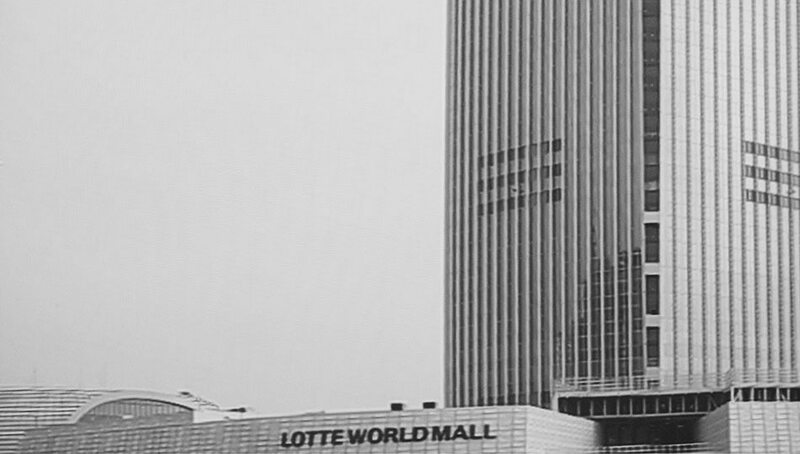 Gloomy monochromatic scenes sequenced in dreamlike fashion depict an alternative Seoul where the material and the diagrammatic homogenize as Kim reorganizes his father’s last moments through the data recorded on a GPS tracker and cardiogram found on his father. Coupled with a narration in the format of an elegiac and monologic epistolary addressed to his girlfriend Ludmilla, Lifting Barbells is effectively a 21st century noir film that starts off as the reconstruction of a person’s final moments before it turns into a meditation on the hollowness of contemporary life—a state of affairs resulting from a catastrophic merging of the real and the virtual. Also addressing our contemporary media landscape is Montelibano’s Sorry for the Inconvenience (2011). 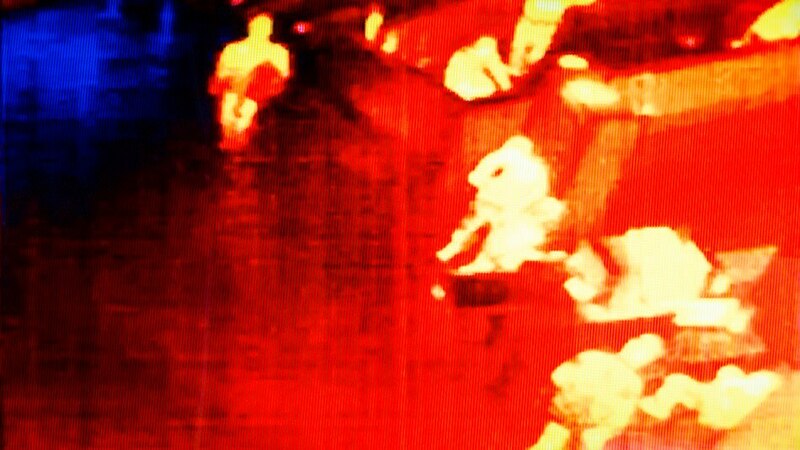 Displayed on different screens, appropriated videos of speeches made by political figures such as Adolf Hitler and Gloria Macapagal-Arroyo flicker and stutter, their garbled speeches echo and bleed into each other, and appear prescient for exposing the subjugating power of mass media, and exploring disorientation as a strategy for control. As I write this article, I can’t help but wonder why they positioned Unrestricted Areas by the entrance. Does it act as a prelude for the show? If so, how is it a prelude to the other works? Does its metaphor of giving museumgoers remote access to restricted areas, metaphorically reversing conventional roles of power, apply to the exhibition as a whole? As mentioned in the booklet supplementing the show, Michel Foucault describes those inside the panopticon as “being at the receiving end of asymmetrical surveillance: he is seen, but he does not see; he is an object of information, never a subject of communication.” Are all the works on display attempts by their respective artists at seeing, at becoming subjects of communication, and is Unrestricted Areas the most literal articulation of this desire? The exhibition’s title references W.B. Yeats’ poem “The Second Coming” while the essay in the booklet ends with “the exhibition looks to present this complexity… giving us space to navigate away from a center and build our own systems, giving access to our capacity to imagine alternative futures.” Does the show similarly suggest an apocalyptic “second coming,” a rough beast slouching towards Bethlehem, and are the works presented as prompts for us to imagine solutions? If so, it then makes sense that Unrestricted Areas greets visitors; ideally to help us navigate away from a center, potentially stimulating our imagination by making us question our present condition. But are we really navigating away from a center by experiencing these works? Everything on display engages in rethinking something, be it cartography, urban life, or mass media. However, I can’t help but feel that the show leans more towards cynicism if not pessimism, presenting fewer proposals for alternative futures than hackneyed aesthetic interrogations.